ALTER G Anti-Gravity Treadmills™ are being used by NASA and Pro Sports Teams and there now available for you in St Petersburg FL. 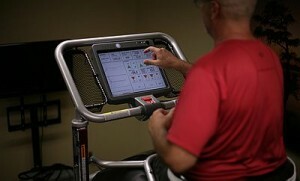 G-Trainers will allow you to improve your mobility and speed recovery from injuries and surgeries fast. 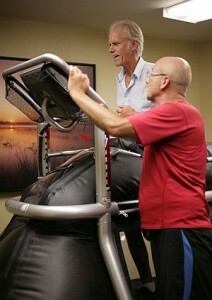 That’s just one of the reasons professional athletes use the Alter G Anti-Gravity Treadmill. This is a real 21st Century way to effectively overcome medical conditions that limit movement, and slow down healing while enhancing your physical performance. There’s no reason to spend months on crutches and walkers any longer. If you’re an elite athlete who can’t afford to spend time on the bench or you simply don’t feel like sitting still and waiting for injuries to heal well enough to allow you to begin rehab and the exercise needed to get your normal life back again. Physical activity and exercise is what’s needed to regain your health after injuries and surgeries, but physical activity is often not possible with many medical conditions that limit your mobility. The G-Trainer will allow you to improve your overall health, benefiting from exercise regardless of what’s limiting your mobility and weight bearing exercises needed to regain the use of your injured body. You can now rehabilitate and recover from injuries faster and more effectively, with less pain after injury or surgery from injuries in your lower extremities. Whether you’re a professional athlete or you like to golf and enjoy other sports with your friends, it’s better to prevent injuries than spending time recovering from them. The ALTER G-Trainer allows you to experience all the healthy benefits of walking and running while you’re reducing the risk of injury and you’re getting a great cardiovascular workout without the pain many of us experience while exercising. The ALTER G also allows professional and amateur athletes to increase your training volume and speed while you lower the risk of impact-related injuries, so you can continue your training without the pain caused by chronic injuries. Professional athletes and amateurs are all interested in the new technological advancements that will allow them to train harder and faster. The ALTER G-Trainer is being used by professional athletic trainers and exercise facilities to augment training and athletes conditioning routines while enhancing their performance the reduced-impact exercise available now with the ALTER G.
The ALTER G will reduce your body weight easily without restrictions, while maintaining a normal gait, stride length, bounding, leg kicks, and body positioning. You can now overcome all the limitations such as water resistance and cumbersome harnesses with conventional unweighted systems allowing for a natural gait pattern. The ALTER G-Trainer’s supportive force is at your core and is equally distributed over your lower body and is very comfortable while allowing for your natural body movements. You can now walk or run with a full range of motion. Not only will you have a full stride length but your upper body movements won’t be restricted. Until now the systems that support a person’s weight during rehab make it nearly impossible to achieve a full range of motion. Because the ALTER G-Trainer allows you to reduce your body weight you’re able to even extend range of motion to condition muscles more thoroughly. The Alter G-Trainer will add reduction of body weight to traditional treadmill speed and incline. Variables can be adjusted and programmed to meet all of your health, medical, therapeutic, training, or conditioning needs. The ALTER G-Trainer will continually adjust to ensure the accuracy of set variables remains constant throughout your entire training or rehab session. Weight, speed, and incline settings are set with precision within a broad range of settings that will be perfect for you. Your body weight can be reduced to as low as 20% of your body weight with reduction increments of 1% allowing for progressive weight bearing. Speed variables can be adjusted up to 18 miles per hour in forward motion or 10 miles per hour in reverse and inclines can be set for up to 15%. We welcome you to call us and make an appointment to try the ALTER G and experience what the professionals are using for rehab and training.